I recently began using Pandoc to generate PDF files, using the LaTeX engine, from MarkDown source. Presently, using the book class, I find a distracting attribute of the output is that the major headers are in a more prominent typesetting than even the book title, the former being large and bold, the latter being less large and normal weight. Following the simple principle that whatever is more important is bigger and heavier, I am surprised to find this result from the tools. Is this effect normal, or, to anyone, desirable? How might I override or correct it? For illustration, I processed the text from a classic novel, and included a representation of the result. Note: I had tried using the KOMA-Script book class, which corrected this effect, though at the expense of making the margins much smaller, whereas the standard class limits the amount of text on each page to a much more manageable quantity. I would wish somehow to marry the best features of each layout. You can add things to the preamble using the header-includes field of the pandoc markdown preamble. 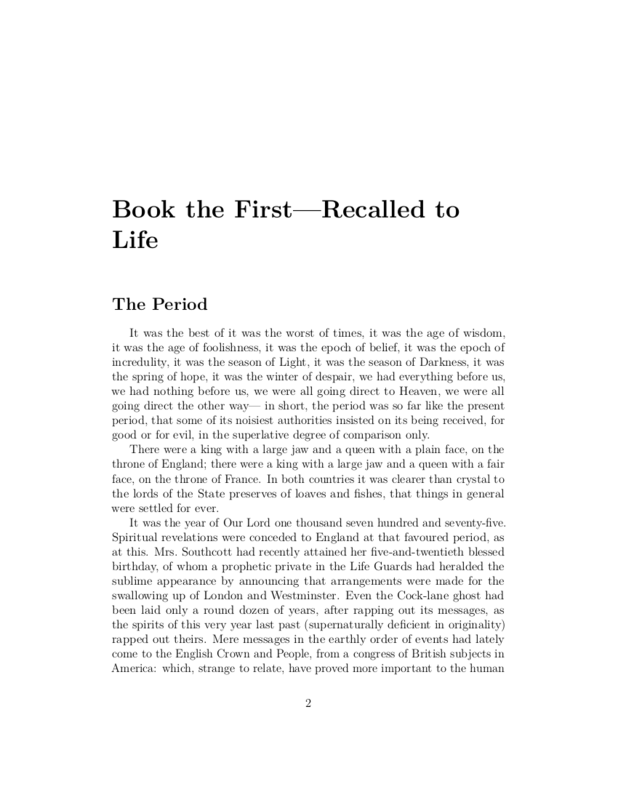 Then you could include the titling package to style the title page to your liking. Full text of “A Tale of Two Cities” by Charles Dickens is available from Project Gutenberg. that things in general were settled for ever. Not the answer you're looking for? Browse other questions tagged books pandoc markdown or ask your own question. How to put running book title on the left of even pages?